Hey blogger, can you relate to any of the situations below? You’re using a free theme which is not easy to look, lack custom features and not SEO Optimized? You’re doing extra manual work because the free plugin you using isn’t giving you access to premium features? Short on budget and can’t afford a new SEO Optimized theme and premium plugins? Well, here’s a great MyThemeShop deal which will let you buy any premium theme and plugins for as low as $19. Ever heard of MyThemeShop? Yes? Well, you can skim the few paragraphs. No? Let me introduce it to you. MyThemeShop is one of the leading WordPress theme and plugin suppliers. It has been continuously recommended by Blogging Experts like Matthew Woodward, Zac Johnson, Harsh Agarwal, etc. They have a collection of more than 130+ Beautiful WordPress Themes and Plugins (includes both free and paid). It means that, no matter what your likes are, you will get a beautiful and fully functional theme here. They keep releasing new theme every month or so, and you can even request the support team to develop a theme for your specific niche. If they see potential in your idea, they’ll develop one! Also, there are a 30 Days Money Back Guarantee to back you up if you’re not satisfied with the results. It is a necessary feature if you want to try out a theme and see if it provides the desired results. In case anything goes wrong, you can get your money back without any hassle. 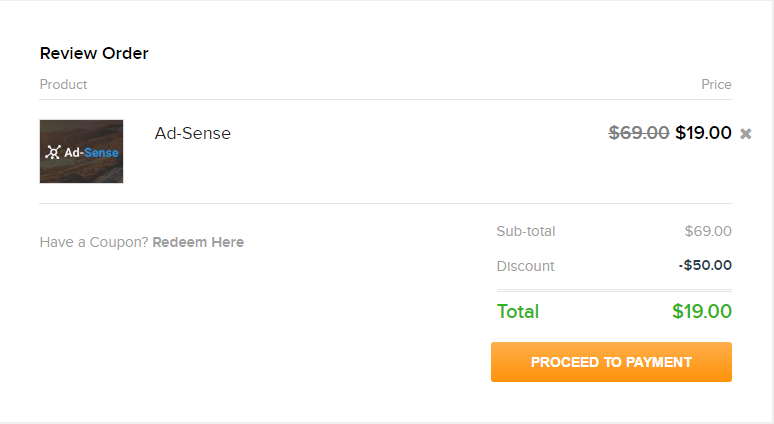 On regular days, any theme from MyThemeShop will cost you $69 and a premium plugin for $39-$69. But, on the occasion of the sixth anniversary of MyThemeShop, you can buy any theme or plugin from MyThemeShop for just $19. That’s around 70% OFF. You can subscribe to their extended membership and get access to all 150 WordPress Themes and Plugins for Just $167 (that’s incredibly cheap). This Promo code will work on all themes, plugins, and the extended membership plan. If you are confused and finding it hard to buy this deal then here are step by step guide for you. 1. Head over to MyThemeShop home page. 2. Search or browse through their collection of WordPress themes and plugins. 3. Choose the one you like and want to buy. 4. Click on Get it Now’ button which will redirect you to your cart. 5. Register a new account or Simply sign in with Google+ and Facebook. 6. Find ‘have a coupon? Redeem here’ on the screen and click on it. 7. Enter MyThemeShop Coupon code – MTS6 and hit Enter. 8. You’ll see the total cart value has been decreased to $19. 9. Click ‘Proceed to Payment’, and continue with the payment. 10. Done! Now you can upload it to your WordPress site and redesign your blog to something awesome. You can use their 24×7 premium support if you have any questions or want to customize some part of the theme. Hurry up! You will never get access to this incredible offer ever again. What do you think about this deal? Is it worth spending or there is a better theme provider who beats MyThemeShop regarding features and pricing? Let me know in comments. Don’t want this offer? Please refer this post to someone who may be in need of it. Lend a helping hand. Thanks for sharing, keep it up the good work.. Thanks for the good words, Kamran. Great deal indeed, thanks for sharing. Great! Chance for discount! Thanks for sharing! Thanks for sharing great deal shafi. I am sorry but MyThemeShop doesn’t provide Joomla Templates. thanks for share this code. i purchased in 14 $. Well, that’s pretty impressive. Did you get sign up bonus of $5?